We recently heard about a gathering in Fargo, North Dakota that mixed beer, live punk music, spoken word, archaeology, the general public, and a do-it-yourself attitude for cultural heritage. Punk Archaeology?! We wanted to know more. Here’s a report from our correspondent Andrew Reinhard, the Director of Publications at the American School of Classical Studies at Athens and a DIY punk scribe who makes music in his basement. Nothing could be more punk rock than an archaeology unconference held at night in a bar in Fargo, North Dakota, in February. The brainchild of professor Bill Caraher of the University of North Dakota, graduate student Aaron Barth of North Dakota State University, and professor Kostis Kourelis of Franklin and Marshall College, the February 2nd event was organic as punk itself. Aaron Barth stepped up to help, speaking with Caraher during fieldwork about Punk Archaeology, deciding to bring Punk Archaeology to reality by hosting a colloquium in Fargo. “We had a great group of scholars willing to contribute, an intriguing group of bands, and a fantastic venue for a meeting that interrogated the borders of the academy, popular culture, and loud, chaotic, and confused social critique,” Caraher said. 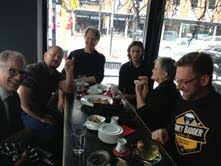 Punk Archaeology speakers gathered at the Hodo Lounge on the afternoon of Feb. 2nd to prepare for the evening and to discuss current projects. Caraher, Kourelis, and Richard Rothaus of Trefoil Cultural and Environmental will spend the weekend of Feb. 9-10 documenting the Man Camps of the Bakken Oil Fields with celebrated cultural photographer Kyle Cassidy. This visit continues a string of trips conducted to study life just outside of the boomtown of Williston, North Dakota. In April, Rothaus and I will also be making a 100-mile transect of the North Dakota Badlands wilderness to explore environmental and archaeological impact of oil exploration in the western half of the state. The evening kicked off at the Sidestreet Grille and Pub promptly at 7:17 with a four-song set of my own punk songs about problems facing archaeology and cultural heritage. Barth assisted on drums. On October 9th last year, Caraher emailed me to see if I’d create some music to play for the unconference. Three months and 17 songs later, the album was as finished as it was ever going to get, and I was ready to play it live. In the spirit of punk’s DIY attitude, I set some limits for myself: each song must 1) be about archaeology or cultural heritage; 2) be recorded at home in my basement by myself with instruments I already owned and without any help from anybody; 3) take three hours or less to write, record, and mix the lyrics and music for each tune; 4) have each part (guitars, drums, vocals) be recorded in three or fewer takes. These rules–musical austerity measures if you will–forced me to strip down to the basics while being as creative as possible in working with what I had. It also allowed me to consider major issues relating to Punk Archaeology ranging from repatriation of the Elgin Marbles, to austerity measures creating more art theft, to the destruction of cultural heritage by religious extremists, to the need for archaeologists to be better at sharing their data with each other and with the world. The spoken word part of the night followed, featuring “papers” by myself, Barth,Caraher, Kourelis, Rothaus, Kris Groberg (NDSU), Joshua Samuels (NDSU), and Peter Schultz (Concordia College). I spoke about discovering punk from a historical perspective, ultimately going native with the music and culture, exploring the punk family tree of bands and how that informed my world-view both personally and professionally. Groberg, an assistant professor of art history at North Dakota State University, recalled her earlier life as a “punk rock mom”, often sleeping bands like Fugazi in her basement when their tours brought them through Moorehead. Caraher instructed all speakers to keep their talks to “the length of a Minutemen song”, to hold the interest of the curious, drinking public, getting immediately to the point. demolished in the late-‘00s. We finished off with “Born to Lose” by Johnny Thunders (1991, his final recording), and then destroyed the bar with the unabridged version of “My Way” by Sid Vicious to mark the anniversary of his death on Feb. 2, 1979. Fargo punk legend June Panic followed us and played a mellow acoustic set. What’s archaeology without a nod to mythology and legend? As the final band of the night, Fargo’s What Kingswood Needs, set up, members of the audience took turns at the open mic to remember their times at Ralph’s Corner Bar. These oral histories were recorded, creating a time capsule of memory on one of the brightest and certainly most colorful eras in the Fargo-Moorehead region. What Kingswood Needs finished the evening with two sets of original, modern punk songs, pulling from contemporary acts like Green Day, Blink 182, and Sum 41, closing the time-loop, bringing the Stooge’s proto-punk of 1969 all the way through to 2013. Thoughts on Punk Archaeology will be published post-haste by the University of North Dakota in the form of a ‘zine, the immortal DIY punk publication platform. Performances and talks were live-streamed during the event, and an edited version of these will be posted in the coming weeks. Caraher’s reflections on the event can be read on his New Archaeology of the Mediterranean World blog. Sponsors included the North Dakota Humanities Council, the Cyprus Research Fund, Bismarck-based Laughing Sun Brewery, Tom Isern of the Center for Heritage Renewal at North Dakota State University as the Patron of Punk, as well as Rothaus who donated the gas in his truck, ferrying instruments to and from the venue, Fargo’s Sidestreet Grille and Pub. 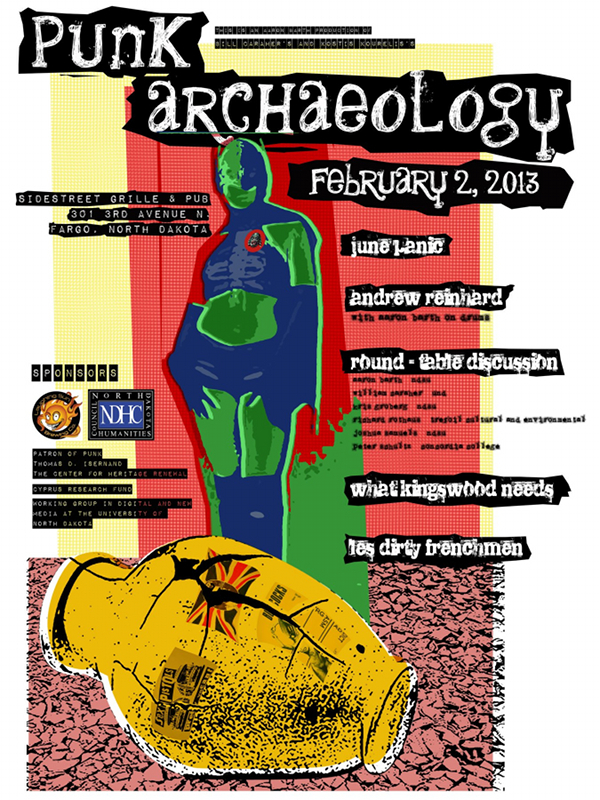 Join the Punk Archaeology conversation and be kept up to date on publications, audio,video, and future events on Facebook. You can follow Andrew Reinhard on Twitter at @adreinhard. This entry was posted in Events, News and tagged Aaron Barth, Andrew Reinhard, archaeology, Bill Caraher, cultural heritage, Elgin Marbles, Kostis Kourelis, punk rock, Repatriate. Bookmark the permalink.